Our Mortgage "Live" transfers or also known as "HOT" transfers are 100% generated by one of our "live" USA based telephone marketing representatives. We offer two types of telemarketed leads, this one, which is pay by the hour, or our 1003 Mortgage Leads, which is pay by the lead. Leads generated through either campaign are exclusive leads and are never resold. Once the prospect is pre-qualified for your customized campaign qualifications, our professional marketing representative transfers the potential borrower directly to you. We are committed to providing a great working relationship and we are with you every step of the way to insure that your campaign runs smoothly and the return on your investment is what you would expect with a specialized marketing campaign. Use our 25 plus years of knowledge & experience with proven strategies to increase your closing rate. Have qualified leads transferred over to you after they have been warmed up by our professional phone reps.
100% USA based call center with American phone reps.
We call on behalf of your company and generate interest in talking to your representative. 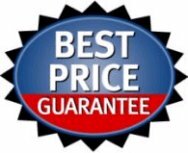 We qualify prospects based on your specific parameters specified by your company. We confirm interest and agreement to transfer. Our representative remains on line, introduces the prospect to your rep and then disengages. Each data record on your call list will be assigned an ID which you can import into your own CRM or Excel spreadsheet to access during the transfer so you will know the details on the prospect. 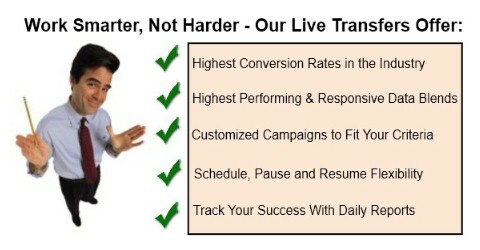 You have total Campaign Flexibility with our mortgage live transfers which means that you can increase, decrease, or pause your lead flow anytime. We can customize your campaign whether you're an individual or you have a large team of loan officers. We can also send you daily reports that will enable you to track your success. What is a Live Transfer? We contact potential borrowers through outbound telemarketing from our call center based in the USA. Once the borrower is pre-qualified and agrees to speak with a mortgage loan officer, the borrower transfers the warm lead directly to the loan officer. If you are tired of doing the marketing and leaving messages, let us do the work and bring interested clients to you! Call us to get the details and how we can custom tailor a campaign for you and your team. Typically, the cost of this campaign would be $37 per hour, plus the cost of the data set you choose to use. All leads are Exclusive Leads to your firm. 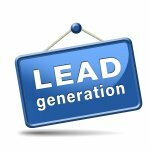 Remember, if you prefer to pay buy the lead, please visit 1003 Mortgage Leads. Thank you and we look forward to hearing from you.